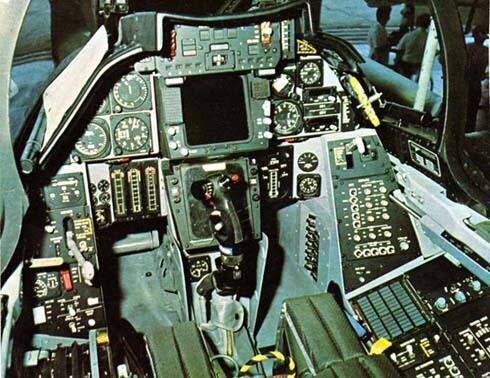 Designed as a carrier-based air-to-air interceptor the Grumman F-14 first flew in 1970 and over 500 were manufactured. 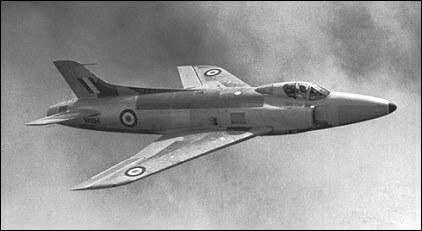 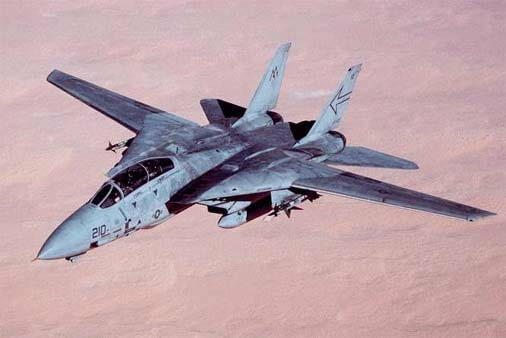 Made famous in the film “Top Gun” the variable geometry aircraft gained a reputation as an extremely capable long range weapon system, though it has only been exported to one other country, Iran. 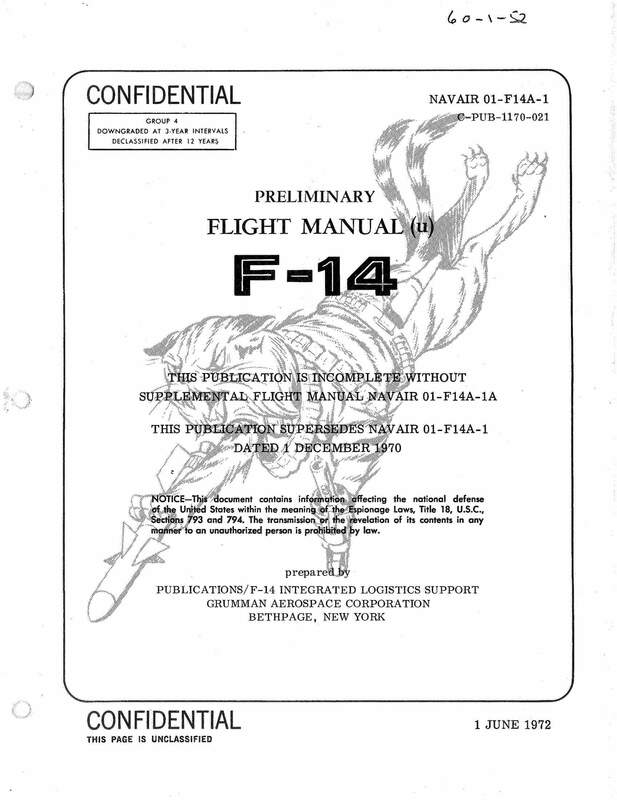 The original F-14A is the principal variant, though an improved version designated the F-14D incorporating improved radar and missile capability, and a new ejector seat system, was developed in the late 1980’s. 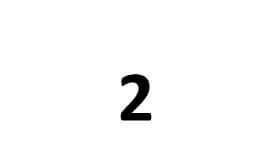 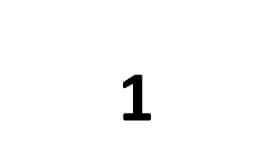 The type was retired from US Navy service in 2006. 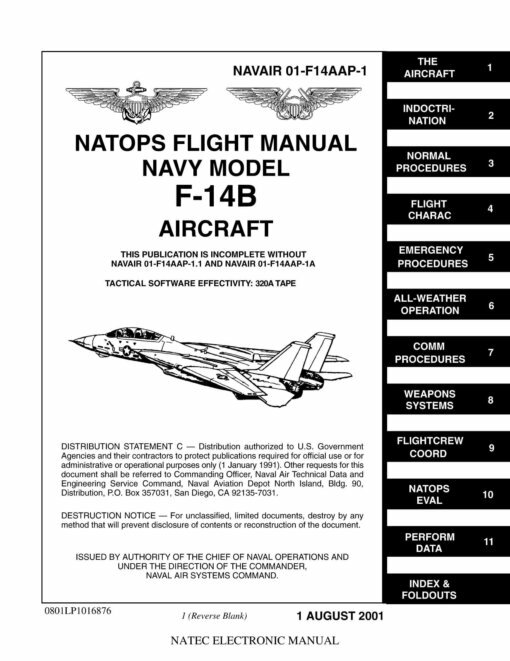 We offer two titles for the F-14 Tomcat which contain the US Navy NATOPS flight manuals for most variants of the F-14 series. Each title is US$9.95. 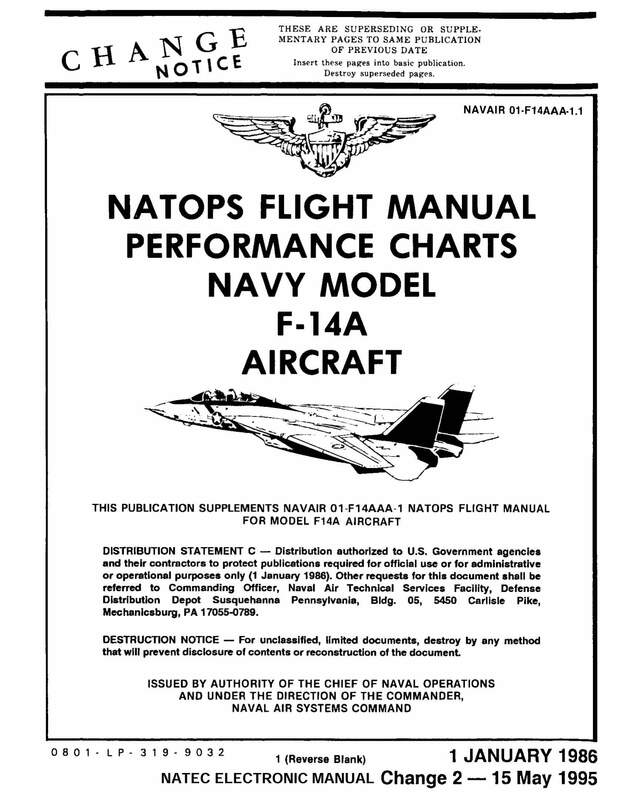 US Navy (Prepared by the manufacturer) Preliminary Flight Manual for the F-14, NAVAIR 01-F14A-1, Grumman publication number C-Pub-1170-21, dated 1-6-72 with approx. 458 pages. 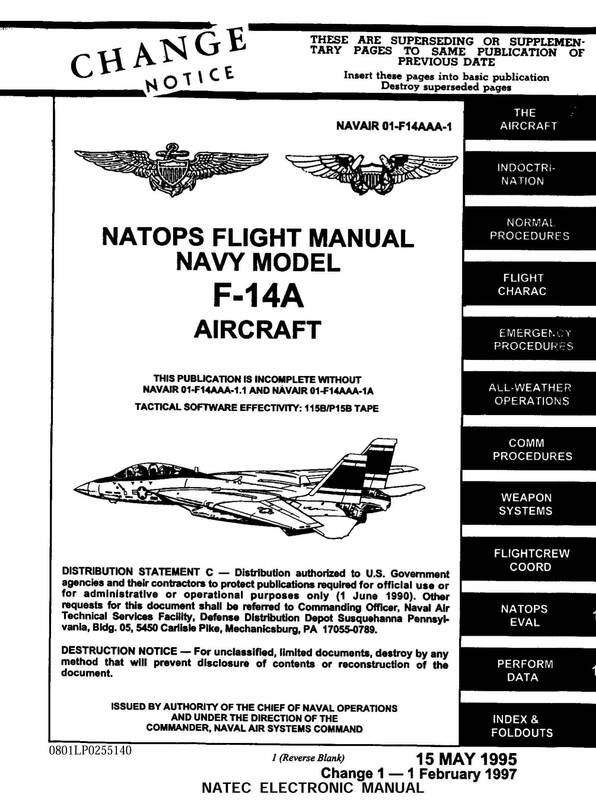 US Navy NATOPS Flight Manual for the F-14A, NAVAIR 01-F14AAA-1, dated 15-5-95, revised to 1-2-97, with approx 913 pages. US Navy NATOPS Flight Manual Performance Charts for the F-14A, NAVAIR 01-F14AAA-1-1, dated 1-1-86, revised to 15-5-95, with approx 339 pages. US Navy NATOPS Flight Manual for the F-14B, NAVAIR 01-F14AAP-1, dated 1-8-01 with approx 965 pages. 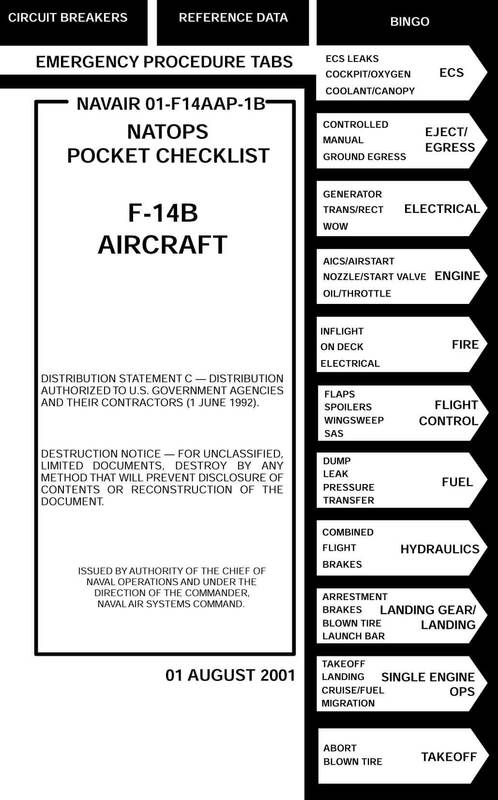 US Navy NATOPS Pilot’s Pocket Checklist for the F-14B, NAVAIR 01-F14AAP-1B, dated 1-8-01, revised to Change 3 dated 15-1-04, with approx 355 pages. 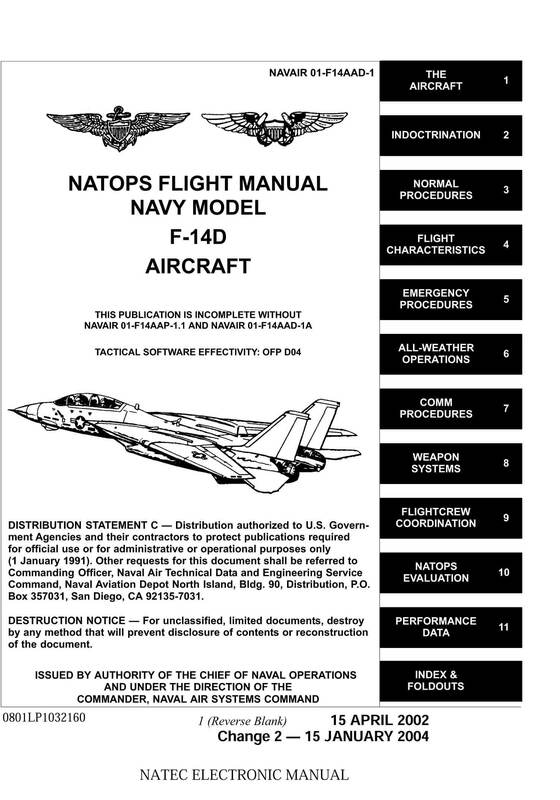 US Navy NATOPS Flight Manual for the F-14D, NAVAIR 01-F14AAD-1, dated 15-4-02 revised to Change 2 dated 15-1-04 with approx. 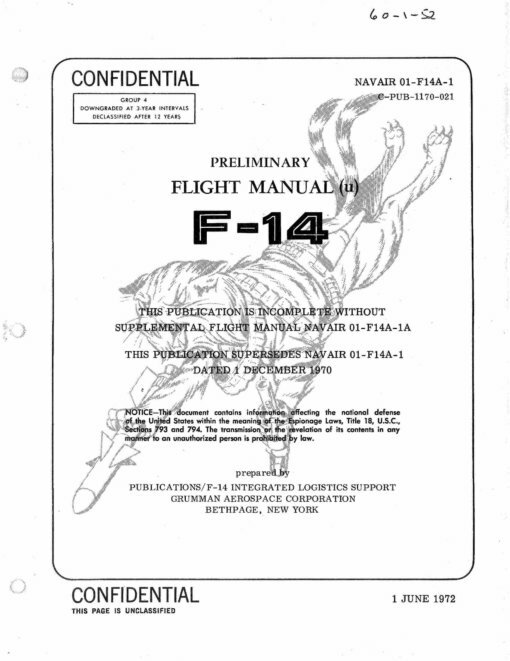 1037 pages.